Never lived in a chicken infested area before I came to Mexico. 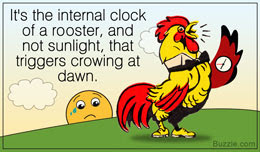 Always thought Roosters crowed in the morning and that was it for the day. Not at all here, they go on all day long and make little noise at night.